The long awaited gift from the City of Lake Worth to the CRA and on to the Armory Annex and now back to the Lake Worth Residents. The following is taken from the Web site. This will be a great opportunity to truly get to know who our artists in Lake Worth are. Something for everyone. LOCATION1121 Lucerne Ave. Lake Worth, FL The Armory Art Center will open its second location called the Armory Art Center Annex in downtown Lake Worth. Formally the shuffleboard center, this 5,000 square foot building, at 1121 Lucerne Avenue. The year-long lease was awarded to the Armory by the Lake Worth Community Redevelopment Agency. It allows the art center the opportunity to enhance to the growing Lake Worth art community already in place. The role out of programming will be incremental starting in late May. The Full schedule of exhibitions, events, workshops, and classes will be in place by June 23rd. The schedule will include exhibitions, one-time Art on the Go! classes and eight week classes. Armory instructors will teach classes in drawing, mixed media painting, oil painting and photography for adults and drawing and BAK and Dreyfoos prep classes for youth. Exhibitions by local artists will include Bob Vail and MeiWei Goethe, Lisette Cedeno, Kenneth Gryzmala, Nune Asatryan and Lisa Solon. Flower Painting in Watercolor Instructor: Anita Lovitt Flowers are particularly well suited to watercolor painting. In this class you will learn how to suggest their delicate effects without being completely literal. Each class will be accompanied by relaxing music, and fresh flowers will be provided which the students may take home. Oil Painting Instructor: Martha Ann Myers Beginning students will be taught a systematic, step-by-step approach in which each class builds on the previous class. Students can expect to learn about color by making color wheel, a color mixing chart, and a gradation value chart, drawing, brushwork, and much more. Intermediate and advanced students may explore subject matter of choice using their own photographs such as landscapes, sharp focus of a single object, room interiors, etc. Application of glazing and veiling is also covered. Discover Acrylics Instructor: Craig McInnes Students will benefit from the 20 + years of experience that the instructor has with the medium. He will offer a variety of techniques, tips and tricks to help all levels of painters to manipulate this challenging medium. Glazing, dry brush, wet on wet, gravity, mediums, alternative tools, effects, texture and blending are just a few of the aspects with which we will be dealing. Bak Prep for Communication Arts Instructor: Mark Fetterly Level: 3rd/4th Grade Don’t just report the news. BE the news! Emphasis will be on presentation of audition components, as well as participation in a timed creative writing prompt and mock interview. This course offers all the tools to get you most prepared for the Bak Communications audition. This includes reading from a TelePrompter like a news reporter; preparing an ad for a magazine; using only clip art; and writing a creative story within 15 minutes. Students will create drawings, paintings, and sculptures, and architecture from life. Examples include still life, drawing from a model, and creating an architectural design – all from real life observation! Students will also be introduced to significant art history, art criticism and aesthetics. Let’s find out how to “see” the hole in the donut! Tuesday Still Life Painting Instructor: Nancy Tart Students will work on color harmonies, composition, and issues of light and dark values to create dynamic still lifes. Participants will learn how to orchestrate set ups using their own objects as well as objects provided by the instructor. Acrylic or Oil Paints. Painting Basics Instructor: Vicki Siegel Learn how to begin a painting, explore color, composition and brushwork in a creative atmosphere. Find your personal style and grow your artistic spirit. Work from your photos or images from the instructor. Acrylics paint preferred, but oil paint accepted in class. The Figure in Costume Instructor: Leslie Albert Many artists through the ages have used the clothed figure as a source of inspiration and challenge. This workshop will focus on depicting the figure in a ‘costume’. Lending a ‘theatrical’ quality to drawing the model, life models will be used while wearing different styles of dress or accessories. Color as well as black and white will be used as well as a variety of media. Students will have the opportunity to draw the figure and fabric incorporating texture, pattern, proportion and perspective into their drawings. Dreyfoos Prep for Visual Arts Instructor: Talia Cervetti Start preparing for the 2015 Dreyfoos School of the Arts audition. Drawing skills will be polished with an emphasis on drawing from a live (clothed) model and still-life. Learn to incorporate design concepts that will be evaluated during the audition process and build the confidence necessary before the “Big Day”. Emphasis will also be placed on the written essay and an artistic vocabulary will be shared and reviewed. Timed practice sessions and real-time audition simulations will be given throughout the course. Wednesday Explore the Link between Color and Emotions Instructor: Martha Ann Myers Have you ever wondered why you prefer some colors better than others? 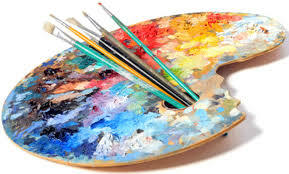 Why you chose certain colors for your art work, to decorate your home interior, or to wear? Color choice is a great way to express yourself. Creativity is in all of us, just expressed in different ways. Colors are a reflection of yourself and a way to express your thoughts, emotions, and feelings. This is a “FUN” class. Learn to bring your awareness of color emotions to the surface! Outdoor Painting in the Shade! Instructor: Sonya Gaskell This class is geared to both beginner and advanced painters. The skills of seeing, simplifying shapes, value, and color will be emphasized at the onset and focus will move towards personal style as well as demos and sharing of Sonya’s own techniques. We will paint in location at both Armory campuses. Essential Watercolor Techniques Instructor: Anita Lovitt Learn how to paint washes, glaze colors, mix paint properly, and get the most out of your materials so that you can achieve the loose, brilliant and succulent affects that make watercolor a joy. Instructor will provide a variety of projects to stimulate students and build confidence. Gentle, constructive critiques are tailored to each student’s level of skill and objectives, nurturing a personal style. Abstract Explorations Instructor: Gary Antonio This Class will focus on seeing and not just looking. We will incorporate found objects that are normally discarded, and witness how the ideas of objects play in the creation of Art. Above all, art making should be fun making. This will be a stress-free class! Painting: All Levels Instructor: Nune Asatryan In this class, you will begin to understand the essential importance of painting in Fine Art and gain the skills and techniques for basic painting. Join others to enjoy getting new hobby or getting your existing professional technique to an all new level. Painting starts with the proper brush and an introduction to advanced methods of delivering gallery quality professional paintings. Composition, perspective, design as well as correct presentation of your artwork will be covered. Cartooning! Instructor: Craig McInnes This class will be about creating dynamic characters and the world they exist in. Students will be taught to approach their characters from all angles (literally and figuratively), drawing them in a variety of styles to find what best suits the personality and feel. Attention will be paid to background story and situation development. Students will also be taught various styles and techniques for hand lettering for use in the comic strip realm. This entry was posted in Armory Art Center Annex, art, art Lake Worth, artfull place, chalk art, culture lake worth, Lake Worth artists, Uncategorized. Bookmark the permalink. What is the process to register for studio space?